Samsung's new Galaxy M line is designed to take on Xiaomi in certain markets where the latter's value pricing strategy has put a dent into Samsung's sales. Just the other day, Samsung released the Galaxy M10 and Galaxy M20 in India. The pair have large LCD panels (6.2-inches and 6.3-inches, respectively), a decent amount of memory/storage, and a dual camera setup on back. The Galaxy M10 comes with a 3400mAh battery, and a whopping 5000mAh battery is employed by the Galaxy M20. Besides the two models already released, Samsung will be releasing the Galaxy M30, which represents the top of the Galaxy M food chain. 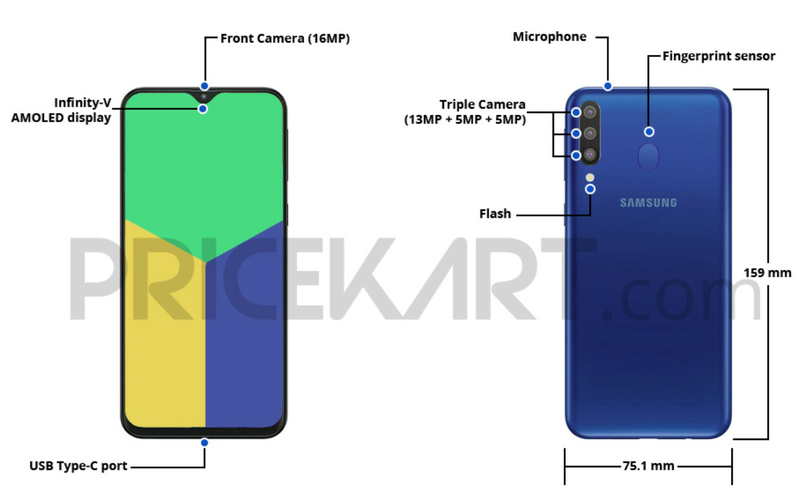 Back in January, we passed along some rumored specs, but today more detailed information about the Galaxy M30 was reported by PriceKart (via MSPower User). The device is expected to feature a 6.38-inch LCD panel with a teardrop notch (Infinity-V display) and a resolution of 1080 x 2210 (FHD+). The Exynos 7904 chipset will be under the hood, and the phone will be equipped with 6GB of RAM and 128GB of native storage (although a 4GB/64GB version is possible). The triple rear camera setup on back will include a 13MP primary sensor with an aperture of f/1.9. A 5MP wide angle sensor will have an aperture of f/2.2, and another 5MP sensor with an f/2.2 aperture will be used as a depth sensor. The front-facing selfie snapper weighs in at 16MP (with an aperture of f/2.0). There is a rear-mounted fingerprint scanner and a massive 5000mAh battery. For some reason, Android 8.1 Oreo, not Android 9 Pie, will be pre-installed. And this is what the state of the smartphone industry is like today. Competition at the low-end of the spectrum has become so fierce that some so-called budget handsets carry specs that would have been considered high-end as recently as last year. Since the Galaxy M30 has yet to be unveiled, pricing is unknown. The Galaxy M10 starts as low as 7,990 Rupees ($112 USD) and the Galaxy M20 is priced at 10,990 Rupees ($155 USD). All three models feature a gradient finish. Wonder if these will appear in US and Europe and how much they'll cost in these markets. they will not appear for sure. not the intended market. they want to sell expensive phones in the EU and USA. They do sell cheap J series in US and EU. True, but the US doesn't have a flood of cheap China phones to compete with and carriers rely heavily on financing. Yeah, unfortunately Sammy will Most likely NOT bring them here. BUT in merging markets they will be selling these and others the J Pro, A6,7,A8,A9, C5,C7,C9 and others. They make this new budget line to take back their market share from honor, OPPO/Vivo/Realme, and Xiaomi. Probably they'll only sell it on India, SE Asia, China, and (probably) some EU country. It's good value, but not impressive. At 200$, the upcoming Redmi Note 7 Pro is expected to employ the Sd 675 SoC. Which is far ahead of the 7904. And the Redmi's other specs might also be better than M30's, except maybe a smaller 4000mAh battery and no wide-angle back cam. Or Xiaomi might give a wide-angle cam, who knows! Either way, it's main cam will be the Sony IMX 586, the same 48MP 1/2-inch one that's in the 500$ Honor View 20. This is better than an iPhone in many ways, no wonder Apple is struggling in so many foreign markets with the competition Android handsets bring for a fraction of the price. You can get a nice camera for that $900 you just saved. It's PLS TFT, no the ancient TN TFT... Samsung hold the patent and make their own PLS, it's just as good (if not better) than IPS panel (IPS is also TFT). Try google it. (or check TFT page on wikipedia, there you can find all TFT types including TN, IPS, PLS and many more). TFT is the backplane, not the panel. A lot of AMOLED screens also have a TFT backplane. Now looking at the picture, says "amoled display".Let's wait. What those idiots at Samsung don't understand is that a fast SOC, fashionable display and lots of ram/storage isn't enough to win their position back. Those xiaomi's also deliver on I/O (IR-blaster and audio jack) and software features (automatic callrecorder build into the dialer etc...). Samsung has the audio jack, and they've got plenty of great software features that make them competitive. 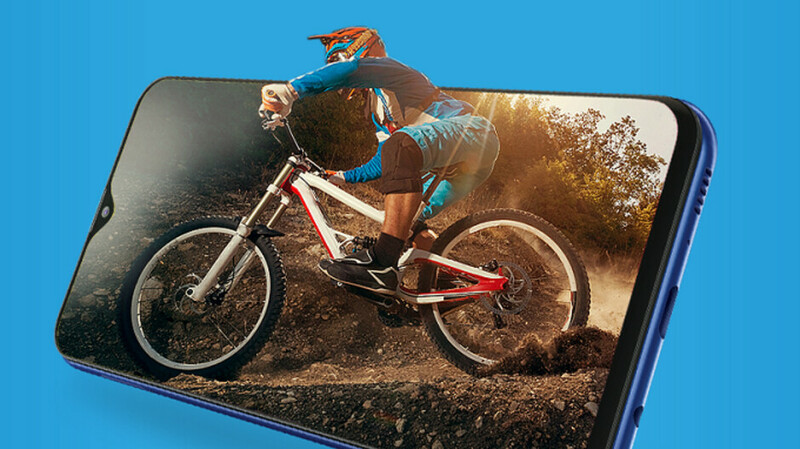 IR is outdated tech and not really needed if you own a modern television. IR is more convenient for basic interaction with televisions. Also, there are other devices using IR, not only TVs.